NHL News : Report: Leafs have another big target in their sights. Report: Leafs have another big target in their sights. Gritty forward headed to Toronto. It appears that the Toronto Maple Leafs intend to make a big push for the Stanley Cup this season. As our readers will already know the Maple Leafs made a big addition in late January when Toronto Maple Leafs general manager Kyle Dubas orchestrated a big trade for Los Angeles Kings veteran defenseman Jake Muzzin. It was a huge move that cost the Leafs a roster player as well as a 1st round pick but it was a move that has strengthened their blue line for the short term future at the very least. That being said though it now appears like the Maple Leafs are not close to being finished ahead of the National Hockey League's trade deadline. On Saturday night during the Hockey Night in Canada broadcast Sportsnet's National Hockey League insider Elliotte Friedman revealed that the Maple Leafs currently have another target in their sights, this time it's a gritty forward with offensive talent to back up his physical attributes. 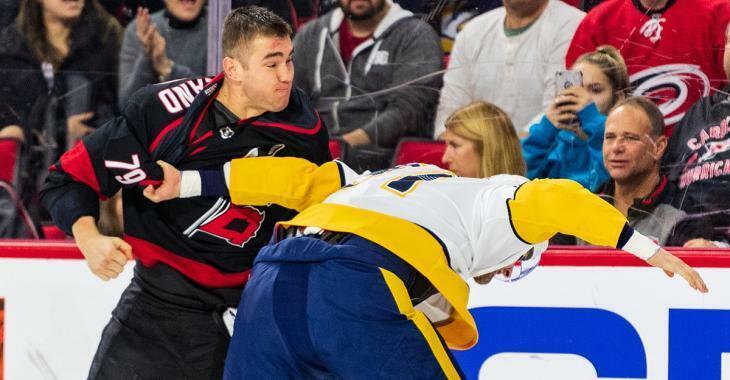 According to Friedman the Maple Leafs have already expressed interest in Micheal Ferland of the Carolina Hurricanes, one of the top players on every trade bait list around the league at this time given the current situation in Carolina. There has been some indication that if the Hurricanes continue to do well and look like a team that may trend towards the postseason that they would consider keeping Ferland on the roster as something of a home grown rental player, but should they falter I have to believe that Ferland will be dealt ahead of the deadline for some type of return before he walks away for nothing at all in the offseason. There is however the matter of price and it will be interesting to see if the Maple Leafs actually get this player given their reluctance to part with some of their top assets. According to Friedman the Leafs are unwilling to trade their top two defensive prospects for a rental player nor are they interested in dealing another first round pick after already giving one up for Jake Muzzin in the trade with the Kings. What Kyle Dubas will offer the Hurricanes remains to be seen, but it's not hard to imagine how a 20 goal scorer who's not afraid to throw down could help the Leafs talented but relatively soft group of forwards.